The beauty of Thai gemstones and jewelry is well-known all over the world. The quality of the precious stone, the cutting and polishing skill of Thai artisan and the intricate designs, all combine to give way to world class jewelry and gems. In 1998, Gems Gallery took its first steps in Phuket, Thailand. Spread out on a 3-acre site, there are over 500 employees waiting to welcome you and provide you with the highest level of satisfaction. You can be assured that all members of the staff are well versed with all there is to know about the gems and jewelry standards. You will definitely be provided with a fully satisfactory, informative and professional session. With more than two decades of hands-on experience relating to jewelry and gemstones, Gems Gallery also takes advantage of more than 4000 years’ worth of accumulated knowledge of Man’s relationship with gemstones. Gems Gallery has everything. When you are about to come on board a shopping extravaganza, do not forget that Thai stores deal with a lot of imported gold, so purchasing gold in the country may be relatively expensive. As for silver items, you will be pleasantly surprised at their price tags, as Thailand has a number of silver mines. Gem Gallery is a tourist destination all by itself. The world famous factory is situated in 4 of the highest tourism spots in Thailand, including Bangkok, Chiang Mai, Pattaya, and Phuket. 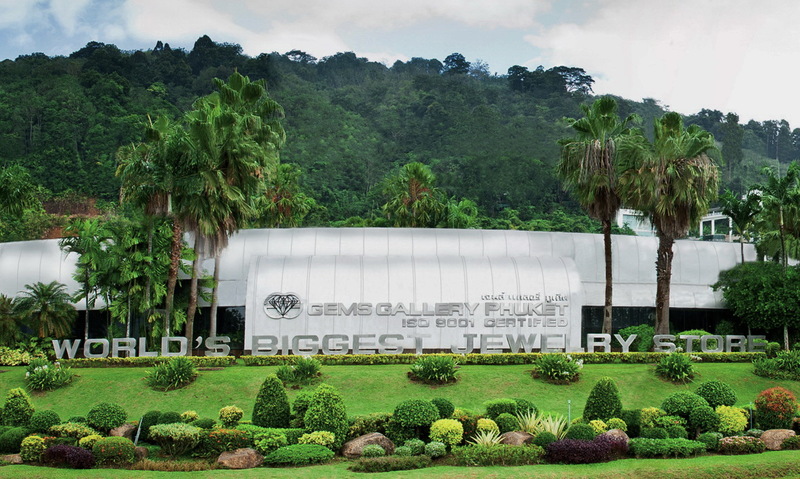 With 4 branches in Thailand, Gems Gallery is by far the largest and most famous jewelry factory with thousands of jewelry masterpieces and dozens of jewelry collections to offer to their beloved customers. Their product prices range from anything between 1,000 to 300,000 Baht. Prices of gold jewelry items typically depend on karat weight, class and quantity of gemstones, with one huge diamond always priced more than a compilation of smaller diamonds. 14-carat gold is unsurprisingly less expensive than 18-carat and is conventionally deployed when working with lower-quality semiprecious stones to provide you with less costly but exquisite designs for your jewelry. Gems Gallery delivers the customers with high-quality silver jewelry. All silver ornaments are coated with rhodium to guard the metal against darkening. Freshwater pearls, precious and semiprecious stones make an unforgettable statement with silver. The factory as an assortment of natural freshwater pearls and south-sea pearls designed in beautiful necklaces, rings, bracelets and earrings to enhance their magnificence to the utmost charm. You can buy single pearls or even put together your own customized set. If you share your vision of the perfect piece with the craftsmen, they would happily create a one-of-a-kind ornament, customized to your preferences, to adorn yourself with. Apart from catering to jewelry fanatics, Gems Gallery has an amazing souvenir department that deals with all sorts of leather and silk items to compliment the feeling of luxurious shopping for both, the ladies and the gentlemen. Items include, wallets, business card cases, belts, ties or the much wanted, ladies favorite, handbags made from pure crocodile, snake or manta skin! To top it off, gents no longer have to worry about long waits while their sweethearts shop. There is an onsite bar with unlimited free welcome drinks to keep you company with as long as you wait. Drinks include soft drinks, tea, and coffee. You can even grab something a little stronger with an extra charge if you please. Gems Gallery promises not only the best quality, natural stones but also provides every customer with a Certificate of Guarantee, stating each product’s name, price, stone type, and the karat weight of gold along with a picture of the product. Diamond jewelry above 0.3 karats will be issued passports by the top-notch gemological institution of GIA. You will also be provided with a lifetime warranty of value and service. The warranty also includes repair and cleaning of the jewelry. You can also demand a free replacement of your purchased item within 3 years if you change your mind about the product. Gems Gallery has been awarded the ISO 9902, ISO 9001:2000 and ISO 9001:2008 on the basis of consistently providing products that meet both, the customers and the regulatory authorities, requirements. The factory has been developing itself on standards that are respected and recognized worldwide. When buying from Gems Gallery you can be confident that you will only be provided with the finest of raw materials and craftsmanship, being of world-class standards. The achieved certifications have pushed customers to gain a high level of trust which leads to more than 4 million people and over 300 leading companies to make a visit each year. Rest assured, any piece of jewelry bought from Gems Gallery will definitely be a source of pride for the owner. The shop is open every day from 08:30 am – 07:00 pm and what’s more, you can avail a free transportation service to and from this beautiful showroom, encasing a multitude of gorgeous gems and stunning jewelry masterpieces, you won’t be able to take your eyes off of. You just need to fill out a simple form from the website and you will soon be contacted by a representative from the Gems Gallery. The transport service is provided to ensure a safe and secure way to travel without the stress of having to worry about anything valuable you might possess. Therefore, it is not at all recommended to travel with unfamiliar people or even taxis. In addition, because of some complicated relations with taxi drivers, Gems Gallery cannot send their company van to pick you up from some hotels. Instead, a private car will be sent and you will be informed beforehand about this.